April reports on a new Garbage Recycling Center that has opened in the city. What makes this news is that it is fully automated – including the trucks (Robo-Trucks) that pick up the garbage on the city streets. Shredder thinks this is newsworthy as well and sends Rocksteady and Bebop up to the Earth’s surface to follow April and get inside the Recycling Center. 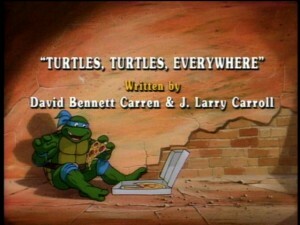 It is his plan to reprogram the system so that the automated Robo-Trucks will seek out the Turtles rather than garbage. Krang provides Shredder with an “over-riding device” that will enable him to command the computer that runs the system at the Recycling Center… and it looks suspiciously like a turtle. Thanks to Shredder, D.U.M.P. 1000, the computer main frame that controls the automated system within the Recycling Center, commands all Robo-Trucks to pick up turtles rather than garbage. Within hours, turtles of every kind and size are disappearing from the city, except of course for the Teenage Mutant Ninja Turtles. Needless to say, Shredder is very unhappy about that. Meanwhile, April contacts the Turtles and warns them about the turtle-nappings. The boys in green decide to hit the streets to apprehend the villain who would harm their relatives. Soon thereafter, the TMNT are being pursued by a Robo-Truck. April witnesses the last surviving Galapagos Sea Turtle, who has crawled up on the beach to lay her eggs, get turtle-napped by a Robo-Truck. In her effort to save the turtle, she is kidnapped as well. April assumes that she is being taken back to the Recycling Center and calls the Turtles for help. The Turtles arrive at the Recycling Center, only to have Donatello abducted by one of the Robo-Trucks while the remaining three Turtles stand by, helpless. The other TMNT finally manage to enter the facility and distract Shredder, Rocksteady and Bebop long enough for Donatello to escape from the ties that bind him and attempt to reprogram D.U.M.P. 1000. Don and April quickly discover the over-riding device and disable it, enabling the D.U.M.P. 1000 to command its system to deal with Shredder and company. After D.U.M.P. 1000 sends Shredder, Rocksteady and Bebop back to the Technodrome, April and the Turtles deliver the Sea Turtle back to the beach so that it can lay its eggs and return to the sea.